Anthony Joshua makes the latest defence of his world heavyweight titles when he faces Carlos Takam this Saturday night and Betfair have boosted Joshua's odds from 1/50 to 16/1! Claim this huge price on Anthony Joshua to win at Betfair, plus £100 in free bets! Will Anthony Joshua’s latest defence of his crown be a successful one despite a late change in opponent? Bookmakers are pricing the Olympic Gold at 1/50 to win the bout against Nigerian-born Carlos Takam. Don't miss this massive price boost! 16/1 Anthony Joshua to win is a real bargain! Place your first bet (max £/€10) on Anthony Joshua to beat Carlos Takam at the current Sportsbook price. 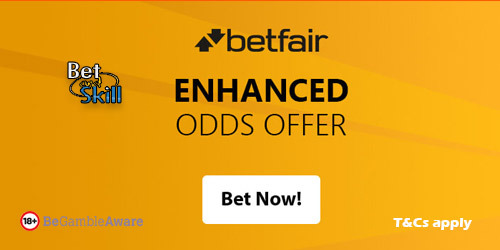 New Betfair customers will receive a welcome package of up to £100 in free bets! Place a bet on Anthony Joshua to beat Carlos Takam in the 'Match Odds' market at the enhanced price on the Sportsbook. Max stake £1. Get a HUGE 200/1 Anthony Crolla to beat Lomachenko at BetVictor! Get a HUGE 100/1 Tyson Fury to beat Willder by KO, TKO or DISQ at BetVictor! Get a HUGE 100/1 Tony Bellew to beat Usyk at BetVictor! "Back 16/1 Anthony Joshua to win vs Carlos Takam at Betfair + £100 in free bets"